Causing great hilarity amongst colleagues at the moment was the announcement of my demise and the presentation of the 'Gareth Long Memorial Cup' at a School Leaving Celebration last week. Even the Hon. Minister looked round to check that I was sitting near him, as he had thought, as this announcement was made. Eventually, after a minute or two, the Master of Ceremonies realised his error and corrected his announcement to another Gareth. I was actually due to present some awards as per the programme, but the poor chap got so confused he then called the wrong person up to present those as well! He obviously thought I was not in a fit state to be able to perform this task, either through shock of the announcement, or the concern I may not be actually breathing! As this ceremony was being broadcast live on Cayman television, many many people listened to the announcement! Numerous comments are still being made, with much humour, mainly on the theme of how well I look ..... considering! I am very pleased to announce that I am, indeed, very much alive and hoping to be doing many more exciting things, with great energy and commitment, for many more years in the world of 21st century education! Following on from the post below, where I arranged for students in Cayman to talk to a school design workshop in the UK organised by Professor Stephen Heppell, I received an email from my colleagues in the excellent education marketing company Grebot Donnelly Associates in the U.K. They have been doing some work with schools in Kent, which, as part of the Building Schools of the Future, had sent some students to... you guessed it .... a workshop about school design, where the students spoke to two countries including the Cayman Islands. Grebot Donnelly just wrote to me to see if I had been involved, which of course I had been. I have never been to Kent, nor been involved with any schools there. Grebot Donnelly had no idea we were doing this project and I had no idea that they were working with the schools involved in the workshop. You never know when you will meet up again with anyone you meet - it's a great feeling, the world really is 'shrinking"! Whenever Professor Heppell joins us for a few days I pack his agenda from morning to night with meetings, and forward planning sessions, both formal and informal, until he gets back onto the plane. Always busy - always fun. He meets endless people many of whom are becoming friends. What every one always remarks to me is about his endless enthusiasm for our ongoing education transformation process and the many good ideas and support he gives us every time they meet. This trip included discussions about the development of our new schools, the all important FF&E issues, future moves in ICT on our campuses, post compulsory education trends, curriculum developments, professional development and so on and so on..... a massive agenda, all continuing to change rapidly. A stimulating few days again that has really motivated so many people. 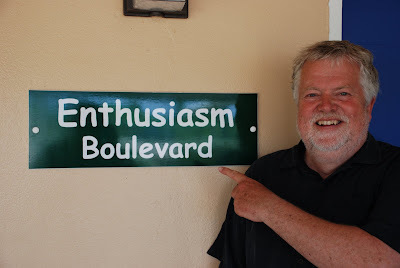 (The photo above is at a local primary school that has 'named' every corridor... a great idea, but wouldn't it have been rather more fun if the students had made the signs rather than the institutional looking engraved signs?? 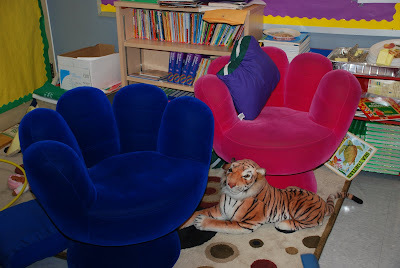 Revisiting a school yesterday, I was really pleased to see the start of much more interesting furniture in classrooms, including the rather vibrant chairs above. Previously a very traditional room with 'standard everything' facing the front in rows, it really has progressed to groups of tables and a variety of different areas within the room. The tiger adds a certain playfulness and is much loved by some students who hold it whilst reading. Students are now rushing to read in this area. Talking to students, they just love it and consider it 'special' when they are there. 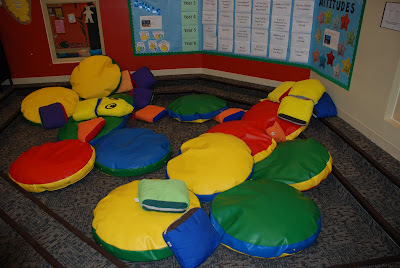 In the same school, the addition of very bright cushions in the sunken seating area of the library (photo below) has transformed the hard very spartan reading / performance area into a popular place where students want to be. There is a real debate between staff though, whether the very vivid colours excite some students too much and whether, in hindsight, the colours should have been much softer. I actually agree with this, and although it is great fun and important to have one or two pieces that are bright, you can have a variety of color and interesting pieces that are much softer to the eye making the room really interesting and calming. The whole FF&E issue is very difficult to get right but, it is a crucially important aspect of every learning environment. What is certain is that students and teachers all have to be consulted in the creation of their spaces and that they can change depending on who works in them for what purpose. It would be sad if these rooms looked identical in five years time... or even next year! Such is the interest in the ongoing education transformation process, that the Hon. Minister has frequently been asked to record a podcast of the presentation given to up to 64 Ministers of Education at the international 'Moving Young Minds' conference in London earlier this year. (See earlier post). There is still major international interest in the Cayman story and we are frequently being contacted by a range of countries for more information. (For original Ministry blog entry click here). I was really pleased this week therefore that I could, at last, actually set it up. Accompanied by Professor Stephen Heppell, the Hon. Minister recorded his first ever podcast with the introduction by Professor Heppell, as was the case in London. The completed podcast will be accompanied by the slide show of images used in the original presentation. Apart from the podcast actually being completed, it also models the use of technology for students, teachers and parents. Students are actively being encouraged to use new technologies - the more we can model, promote and encourage the better. 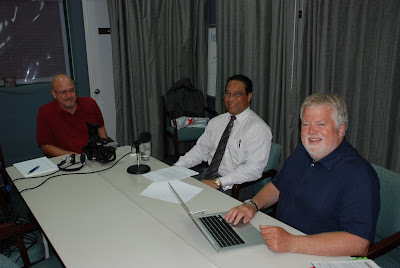 When the technicalities are completed, the podcast will be able to be downloaded from this blog site as well as the Ministry's Brighter Futures website. 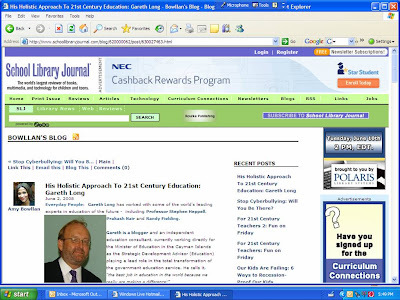 21st century digital learners - why don't we ask them? A really interesting article by Marc Prensky was published recently on the Edutopia site. It really focuses on his experiences of how rarely students are consulted about how they like to learn. This matches my own experience, and even worse, the total disbelief by some teachers that we should even consider asking students about their learning. A previous blog entry of mine refers to an occasions when we asked students to talk about their learning to teachers - what they had to say really blew the teachers away! The way young people learn is changing more and more, their use of emerging technologies is staggering. We really must be helping them use these devices to enhance the school curriculum. Students are frequently more engaged out of the classroom than inside, often becasue they can't use the technology they know will help them. It is obvious really isn't it?............ isn't it? Multi disciplinary approaches to projects - it's a piece of cake! As we move more towards project work and multi disciplinary approaches to subjects in schools, it is easy to see so many examples for students to use as examples and as a stimulus. What subjects and skills does the photo above demonstrate as it combines so many - from: art, design, food technology, a stimulus for literacy work, drama and so many more. However you look at it, it is certainly more than just a cake! 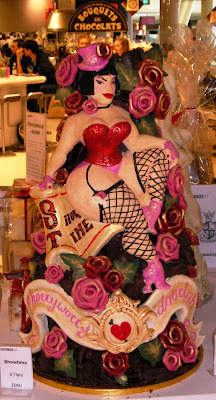 (Mind you with a cost of about US$1,800 (GBP950) would you actually want to eat it? 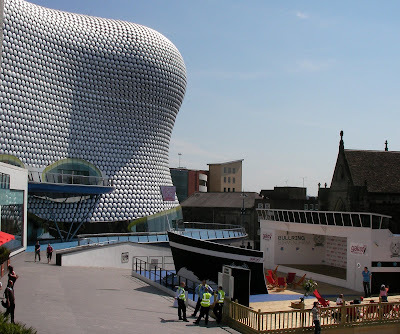 During a lightening visit to the UK this week, I was really pleased to see both performance and play environments outside the striking originally designed Bull Ring Shopping Centre. A sandpit full of happy children, complete with deck chairs, and a small stage allows performance of all sorts for all those passing by. The tiered pedestrian routes (out of picture) also provide many opportunities for audience engagement. It is just so important that we create opportunities for fun and social interaction where ever possible, in a life where it is all too often missing due to the focus on functionality and value for money. There is so much more to life. 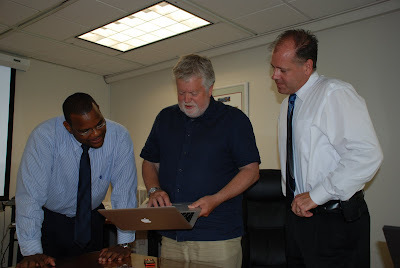 One of the interesting parts of this job in the Cayman Islands is the debate and discussion process as we plan for future developments and plans within the education transformation process. 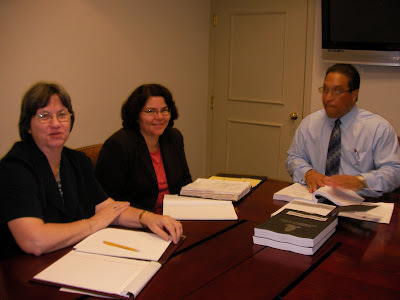 A key part of the process is supporting the Hon. Minister during the annual Finance Committee which takes place in the Legislative Assembly. This is the opportunity that the Opposition and other elected members have to quiz the Minister on spending plans for the next financial year. Questions are obviously not known in advance, but the Hon. Minister always try to give full detailed and instant answers, or for more technical information he reverts to one of us in the senior team that supports him. A key part of preparation is fully briefing the Hon. Minister before hand. It is actually quite exciting and the adrenalin flows as the process takes place and the questions fly. We try to predict areas of questioning - and there is a certain pleasure when we 'get it right!'. How long does it last?.... well it is up to elected members - it may be an hour it may be a couple of days, or more. No one questions that education is important, but the challenges are very varied, real politics are played between the Opposition and the Government, as we mention past performance and explain the exciting plans for the future. 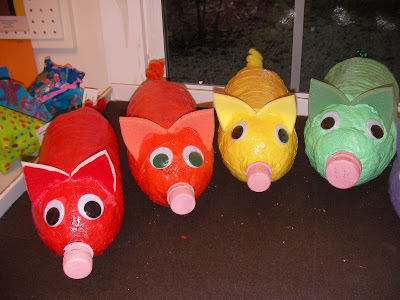 Not a new idea, art teachers have been doing it for years, but these soda bottle pigs just caught my eye whilst attending a students art exhition. As a group, with the amazing colours used, they are really eye catching and fun! Cute really! 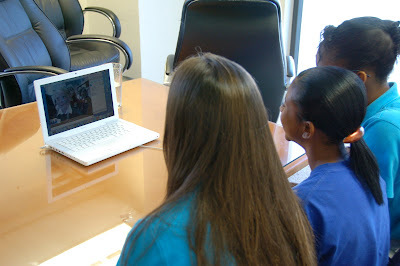 21st century Education - the Cayman Islands story continues to be told.... all over the world. 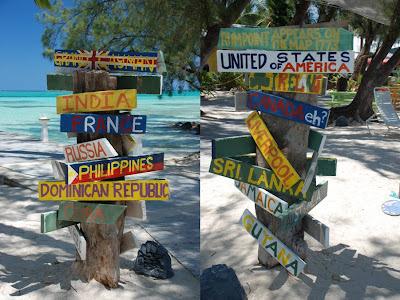 Standing by a 'signpost' at Rum Point last weekend, I was looking at the countries listed and thought to myself that everyone listed has had representatives either logging into my blog, the Ministry blog or attended presentations about the Cayman Islands' story of education transformation. It is the only place in the world to be undertaking the process of a total holistic transformation of every aspect of the education service simultaneously and the journey continues apace. It is attracting one hundred and ten countries visiting the Ministry blog and rapidly approaching that number hitting my blog - there is ever increasing interest in how the transformation process is being implemented, and especially the results so far. Additionally, it is amazing just how many people are discussing the work we are doing all over the world, in lectures, in magazines, in seminars and in discussions. When I accompanied the Minster to the World Ministers' Seminar on Technology in Education in London in January, his outline of the Cayman story was so popular he had to, unexpectedly, do two 'back to back' seminars to up to sixty four Ministers from all round the world. Professor Stephen Heppell and Prakash Nair mention us all over the place as they constantly travel internationally. Our architects, oWp/p from Chicago mention our innovative cutting edge secondary campus designs all over, from Italy, UK and the States. There are even people who have had little to do with any aspect of the process doing presentations based on the Cayman work, or writing articles (sometime inaccurately) - amazing really! The interest follows us around - as I visit London briefly at the end of this week I have already had notice that people will be asking me for more information about the transformation process, which is exciting, but not the focus of my visit. 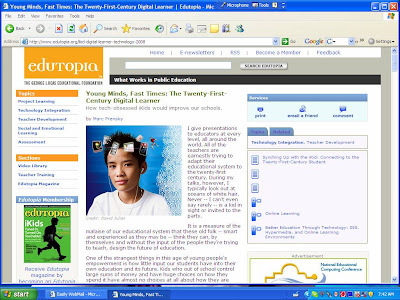 Our focus however, is not buildings, or systems - it is all about the students first and foremost and trying to ensure that whatever we have in place, it allows them to be taught in a relevant, appropriate way, utilizing their strengths, their skills and utilizing their technological abilities. It is about engaging them and exciting them in education whilst preparing them for the future demands of our employers and encouraging them to achieve the stage when they can can compete in the global workforce More than many countries, this is especially a key factor in the Cayman Islands with our international finance centre status and all accompanying opportunities, in addition to the very large tourism sector. Have we finished or got it all totally right? No, of course not, to both, but with our programme of constant evaluation, when we see any aspect going off course we can address the issue immediately and be prepared to be flexible in our methods to achieve the end result, and it IS paying dividends. I have been fortunate to have been involved from the very start. There is no doubt that the country has been brave, very brave - far braver than many would be. The secret is for us to continue to be brave for long enough as we approach the next crucial stages of the implentation journey and not allow ourselves to be distracted at any stage. if anyone is not sure - just ask the students! There are a large number of students, who are ambitious and excited by new approaches to learning, they know what they want and how they would like to be taught. Remaining the same is not an option.......... nor should it be!